Let me boost my L.Q. 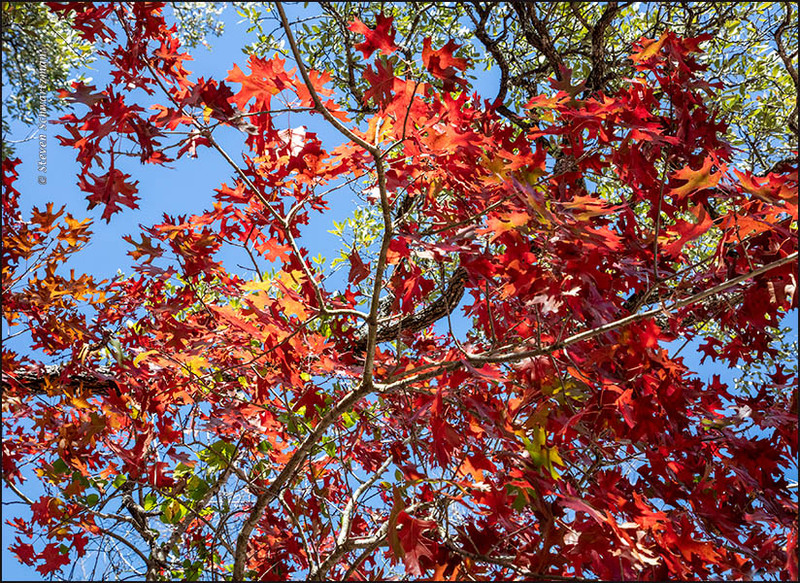 (landscape quotient) with this scene from the Bull Creek watershed on October 31. 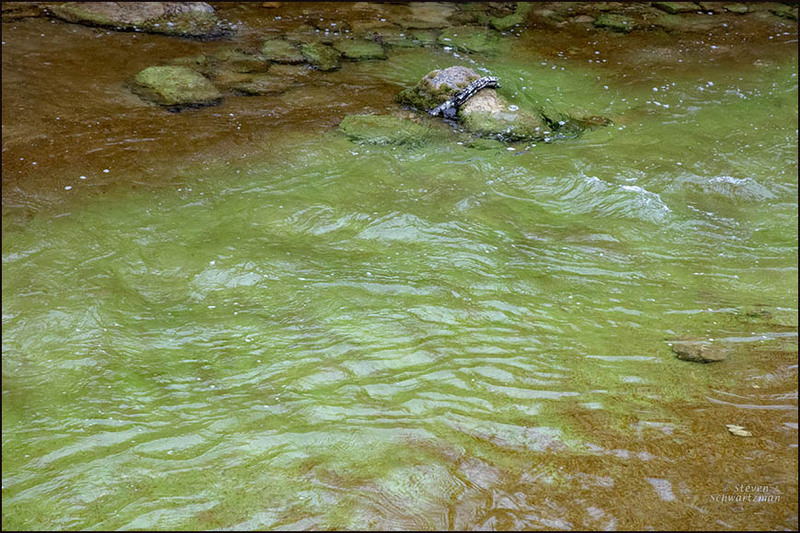 You’re seeing the confluence of two tributaries of Bull Creek as they looked after heavy rain the previous day and again in the overnight. 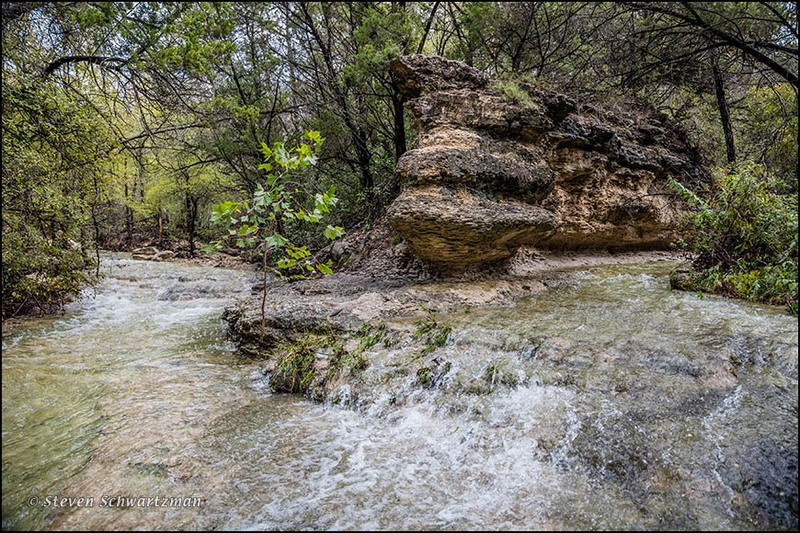 Notice the hardy sycamore sapling (Platanus occidentalis) seemingly growing out of the limestone where the two creeks meet. If your eyes could glance upstream along the creek on the left (which they can), and then follow the water around the bend for a while (which they can’t), you’d have a view of the waterfall I showed you last week. 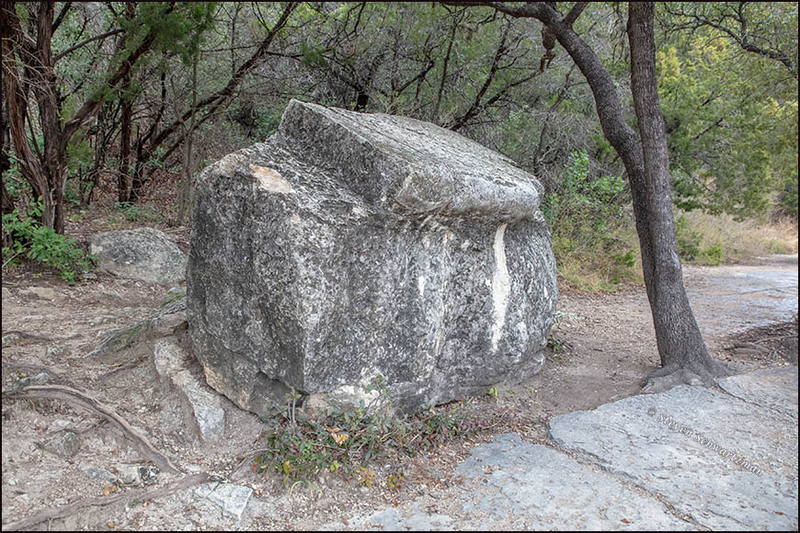 Between my previous visit to this spot and the current one, somebody (or somebodies) had defaced the upper part of the rocks at the V between the creeks, so I used a bit of digital magic to return those marred rocks to a natural state. 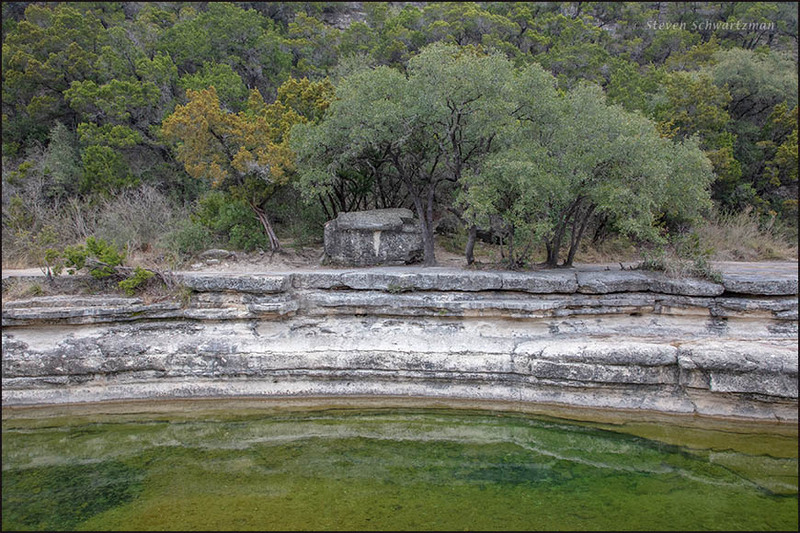 For more information about Bull Creek, including a look at a scenic postcard from 1916, you can check out the relevant Wikipedia article. Click for better clarity and quality. 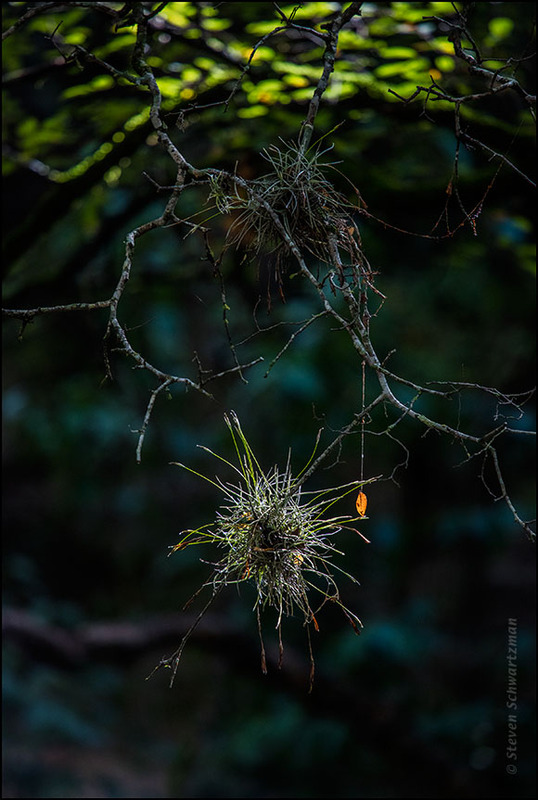 The place was a newly opened section of the Violet Crown Trail north of US 290, where the sunlight coming through the forest canopy on the morning of September 2nd lit up the lower of two ball mosses, Tillandsia recurvata. Next to the highlighted ball moss—which is no moss—a dry leaf rotated in the breeze at the end of a long strand of spider silk; here, at the right moment in its cycle, the leaf was fully backlit. Some of the leaves overhead, likewise illuminated, glowed green across the top of the image. You can read more about the new section of the Violet Crown Trail in an article by Pam Leblanc (who was a calculus student of mine more than 30 years ago). A comment and response in the previous post mentioned that poison ivy can grow as a vine. 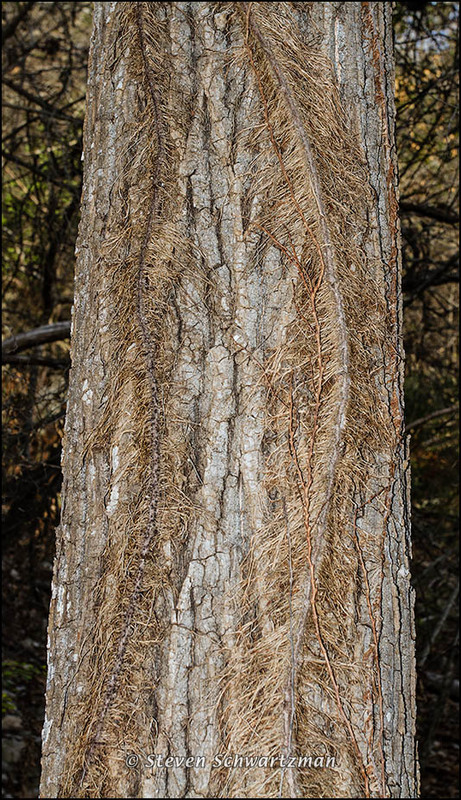 To make that clearer, here’s a picture from January 19, 2012, of two poison ivy vines that had climbed a tree in a wooded part of Great Hills Park. 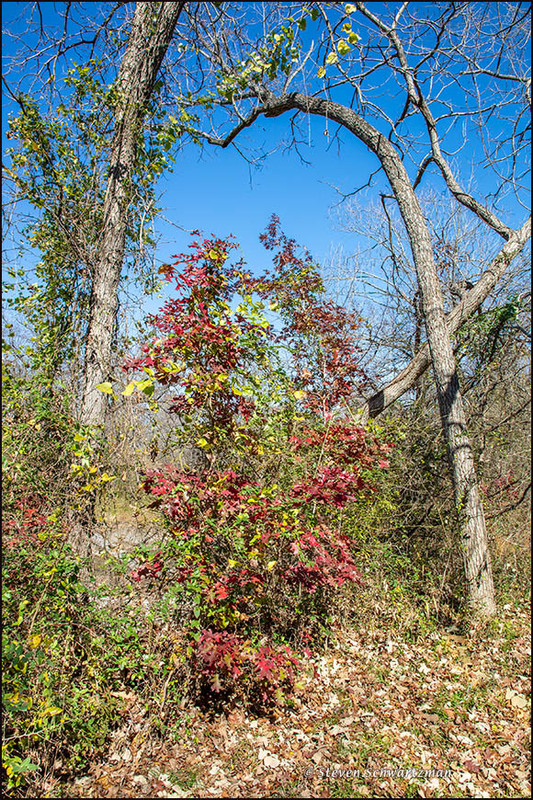 The aerial (as opposed to underground) rootlets that poison ivy uses to attach itself to a tree can be a warning sign to people who might otherwise innocently touch or lean against a tree like this one. The second word in the scientific name Toxicodendron radicans means ‘rooting,’ and now you see why that word was chosen. You’ve heard me say that Great Hills Park is my neighborhood park, and fortunately one that because of its terrain is bound to remain almost totally undeveloped. On the afternoon of January 19, with temperatures in the upper 70s, I went photographing along an upper branch of the unnamed creek that runs through the park and whose presence is among the reasons the land can’t be built on. At one point, when I’d just finished balancing my way across the creek on some concrete steps, I suddenly glimpsed a large bird of a type that I don’t remember ever seeing before. It was aware of me and it was wary of me, but I quietly switched to my longest lens, cranked up the ISO on my camera to deal with the dim light in the woods, and began taking what pictures I could. 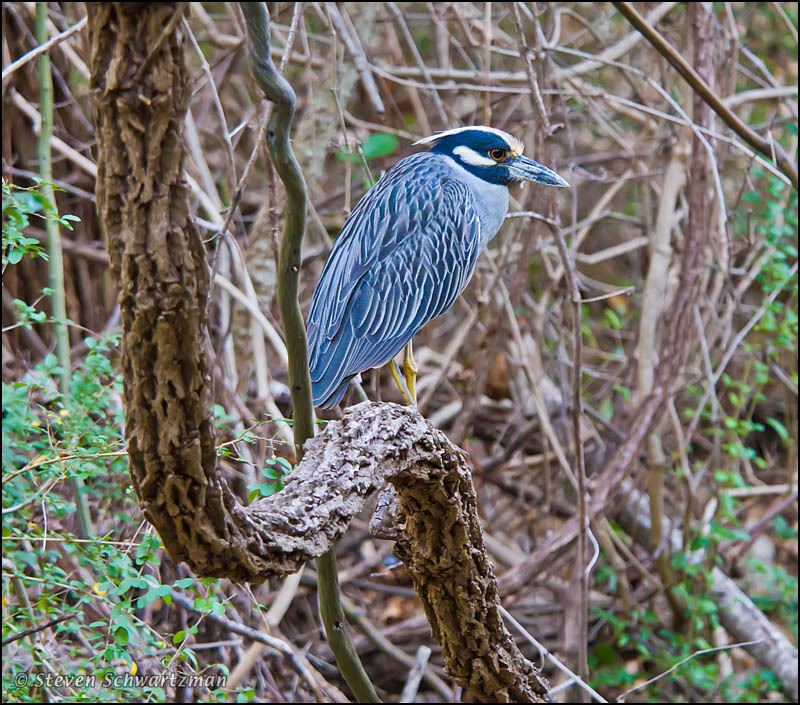 When I got home, excited at having photographed such a picturesque bird, I looked through my copy of John L. Tveten’s The Birds of Texas and managed to identify what I’d seen: it was a yellow-crowned night heron, Nyctanassa violacea. The bird was attracted to the water pooled up in that part of the creek, and that’s why I found it there that afternoon. In addition to new friend bird, you may recognize a couple of twining friends from recent posts: the sinuous, bark-covered form in the foreground is a mustang grape vine, Vitis mustangensis, while the smooth and slender green vines behind it are rattan, Berchemia scandens. But I doubt you’ve paid much attention to the vines when you’ve had this stately heron right in front of you.